Back in the 1980s, when it was an even-money bet whether a rattling, wheezing Hyundai Excel would make it to the repair shop before disintegrating into a pile of rust, nobody would have seen it coming: Hyundai has reached the top of the heap. But Hyundai's award was the eyebrow-raiser. And it was another sign that Korean quality and design are the real deal. The change became apparent this decade when the Korean carmaker began creeping up in quality studies. 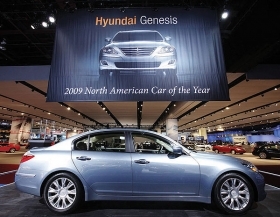 In 2006, Hyundai was the top-rated volume brand in the J.D. Power Initial Quality Study, topping Toyota for the second time in three years. The next year its vehicles took first place in five categories — more than any other automaker — in Strategic Vision's Total Quality Index. When Hyundai, now the world's fifth-largest automaker, said a few years back that it was thinking about a luxury sedan, some people chortled. When it said it was thinking of a new luxury brand a la Totoya's Lexus, the chortle swelled to a guffaw, then a belly laugh.